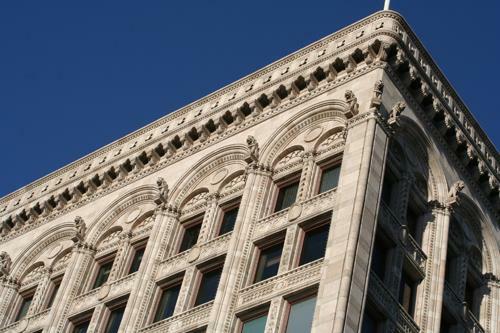 The Telegram building was constructed in 1882 during one of the first building booms in Winnipeg, in anticipation of the railway's arrival. Originally a dry-goods warehouse for Irish wholesaler Robert James Whitla, the building became the home of the Telegram Publishing Company in 1899. It published a weekly paper for farmers before it was bought by the Winnipeg Tribune in 1920. This beautiful Italianate building was given municipal heritage designation on July 14th, 1980, and today houses multiple businesses. The Telegram Building (right) on Albert Street, while on the left is the Dingwall Building. Turning left onto Albert Street, the Telegram building continues to your right, and directly beside it stands the Dingwall Building at 62 Albert Street. The style difference between the two buildings belie the nearly thirty years between their construction. The Dingwall Building was designed by J.H.G. Russell for Donald Ross Dingwall, purveyor of fancy ladies' jewelry and mens' and ladies' watches. Dingwall's business flourished in its central Winnipeg location, before being absorbed by Birks in 1933. It's easy to picture yourself browsing for a nice watch on the other side of its beautiful facade. 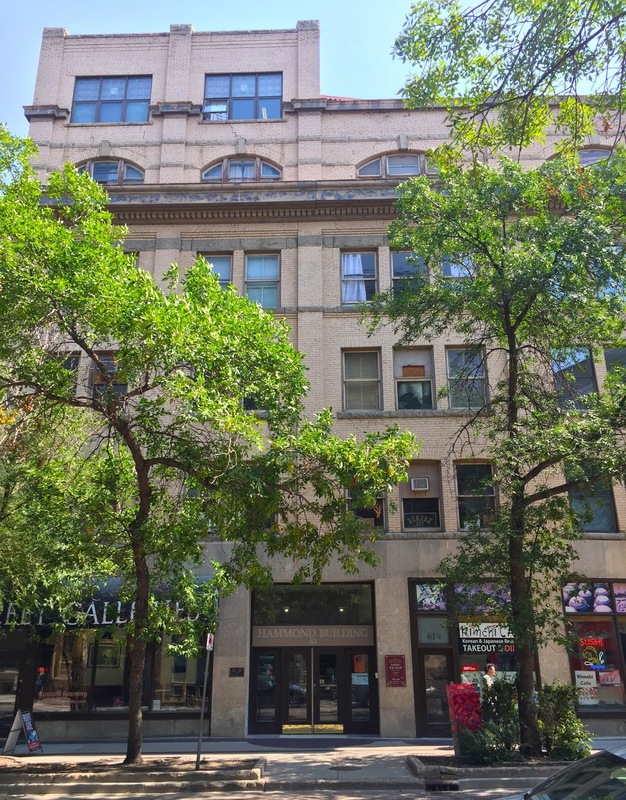 The Dingwall Building, now rented by various businesses, was designated a heritage building by the City of Winnipeg on March 27th, 1985. Looking south down Albert Street, the Dingwall Building (r) and the Hammond Building (l). Front (west) facade of Hammond Building, present day. Directly across the street from the Dingwall Building is the Hammond Building, containing the 61 - 65 Albert Street addresses. 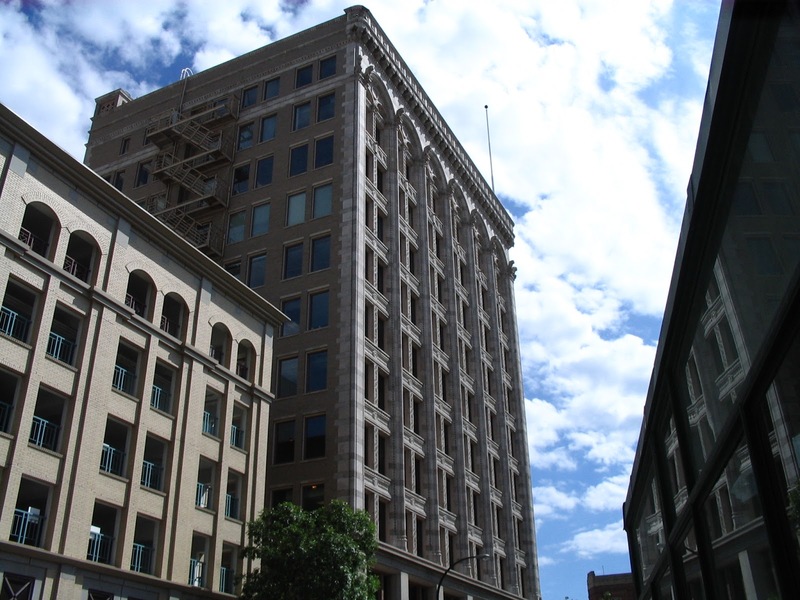 The Hammond Building was so named and built in 1902 for one William Hammond, prominent early milliner, hatter and furrier in Winnipeg. Although the Hammond Building is six storeys high today, if you had been walking down Albert in 1903, it would have only been two! An additional two storeys were added in 1905, and more additions in 1907 and 1909 to bring it to five storeys with half the sixth storey - and it's a good thing they did, since the Heritage Winnipeg offices are on the fifth floor! Then, in 1993, a 4000 square foot solarium was added to complete the sixth floor, which was the first addition ever put on a designated heritage building in Winnipeg. The Hammond Building is a particularly interesting building to work in - in the Heritage Winnipeg office, there are beautifully detailed tin-pressed ceilings. And, if you're lucky, you might get to take a ride on the building's over 100-year-old freight elevator. The Hammond Building was granted municipal heritage designation, shortly after being acquired by the Heritage Canada Foundation in 1978, on July 14th, 1980. The Gregg Building looking south down Albert Street, present day. Continuing south on Albert Street, the next building on the right, next to the Dingwall Building, is the Gregg Building. Designed by James Cadham in the Richardsonian Romanesque style, for George R. Gregg, this building was constructed in 1902. Gregg sold expensive textiles from Japan and China out of his storefront for many years. Several "ghost signs" adorn the north side of the building, advertising long-discontinued products like "Wilder's Stomach Powder". The Gregg Building received municipal heritage designation on May 27th, 1985. Royal Albert Arms Hotel, present-day. Directly beside the Gregg Building to the south, is the Royal Albert Arms Hotel. Located at 48 Albert Street, this hotel was built in 1913, during the Wheat Boom (1896 - 1913). It was designed in Spanish Colonial Revival style by Edgar D. McGuire for the original owners, J. Patrick Grogan and Angelo Ferrari, and received municipal heritage designation on May 19th, 1981. This stylish hotel was meant to bring a European flavour to Albert Street - and more than 100 years later, this historic building houses another Winnipeg tradition. Alycia's Restaurant has just recently moved into the Royal Albert Arms Hotel, on the main floor in the cafe space. The original Alycia's opened in 1971 and operated until 2011 when founder Marion Staff died, opened again in Gimli in 2016, and has now moved back to Winnipeg. We've done a more in-depth post on the Royal Albert - check that out here! 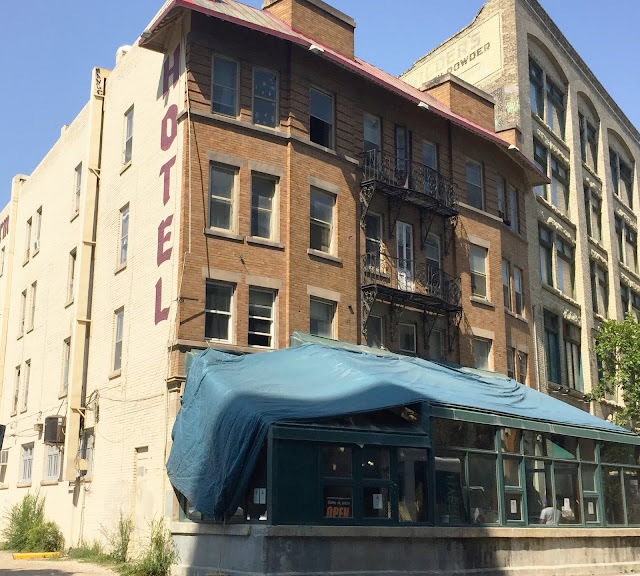 The St. Charles Hotel, present-day. Nearing the end of Albert Street, two buildings (technically on Notre Dame) flank the intersection. First, on the right going south, is the St. Charles Hotel. This hotel was also built in 1913, and that two hotels could be built so close and still survive is a testament to the height of the boom era in the early part of the 20th century. 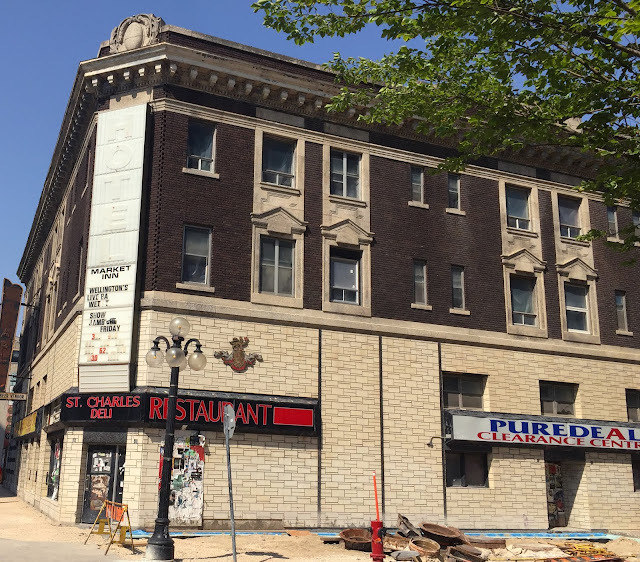 The St. Charles Hotel was designed by Winnipeg firm Carter, Halls, & Aldinger, cost about $122,000 to build, and was originally owned by the same man who owned the St. Regis Hotel. This historic building was given municipal heritage designation on March 24th, 1988. The Electric Railway Chambers Building, from outside the Royal Albert Arms. To the left is the modern parkade. Saving the best for last, looking to the left of the street we see the Electric Railway Chambers Building. One of Winnipeg's early skyscrapers, it was built in 1912 and is a gorgeous example of the Chicago style of architecture, particularly the Sullivanesque type, named for Chicago architect Louis Sullivan. The Sullivanesque style is eminent in the vertical emphasis and the clear development of three sections in the elevation - base, shaft, and capital. The gleaming exterior of the building is due to the use of terracotta in the ornamentation. Detail of the capital and cornice of the Electric Railway Chambers Building. This landmark building was home to the Winnipeg Electric Rail Company, which controlled Winnipeg streetcars, electricity and gas service, for over 35 years. The impressive headquarters cost the company around $800,000 (compare to the cost of the St. Charles Hotel, a year later). The company had expanded into about half of the building's space by 1944, and in 1953 the provincial government finally took over the delivery of services, including buying the plants, buildings, and buses involved. We've reached the end of Albert Street, and come onto Notre Dame. Thanks for taking this tour of an area near and dear to our hearts at Heritage Winnipeg. Albert Street is only one short block and the rest of the Exchange District is just as densely packed with history and heritage. The Exchange District BIZ offers fantastic walking tours, find out more here!